Figure 1-1. Expendable Launch Vehicles, 1974. Source: NASA Headquarters, SV75-15217, Nov. 13, 1974. This chapter will provide the researcher with information on the management of NASA's launch vehicle program, the agency's launch vehicle budget (including a general introduction to the budget process), and the characteristics of each launch vehicle family used by NASA during 1969-1978. For data on those vehicles used before 1969, consult Linda Neuman Ezell, NASA Historical Data Book, 1958-1968, Vol. 2, Programs and Projects, NASA SP-4012 (Washington, D.C., 1986), chapter 1. Figure 1-2. NASA Space Transportation Systems, 1978. At the end of NASA's second decade, the agency was looking at these four vehicles to provide most of the civilian launches during the 1980s. 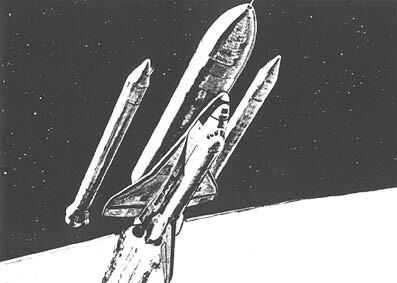 Advanced planners were predicting that the reusable Shuttle would eventually make conventional expendable boosters obsolete. [6-7] Table 1-1. Three Phases of Launch Vehicle Management, NASA Headquarters. ....launch vehicle that required testing. Since the early 1960s, the Office of Advanced Research and Technology (O,ART) had been charged with managing advanced chemical propulsion research, but this responsibility was dropped from OART's mission in late 1970. During the 1970s, NASA managers began making the distinction between expendable boasters (traditional vehicles designed for one-time use) and reusable space transportation systems (a shuttle orbiter and some reusable booster vehicle). This trend toward reusability at the end of the Apollo era prompted a reorganization of the launch vehicle program. In late September 1975, Mahon and his launch vehicle managers were moved from the Office of Space Science and Applications, where they had been since 1961, to the newly formed Office of Space Flight, which was under the direction of Associate Administrator John F, Yardley (table 1-1, Phase II). Mahon had several vehicle managers to help him oversee NASA's expendable launch vehicle program: F. Robert Schmidt (Atlas-Centaur), B. C Lain (Titan III), Peter Eaton (Delta), Paul E. Goozh (Scout), and Jay, A, Salmanson (Atlas F). In 1976, Jack W. Wild was given responsibility for managing studies and proposals for Shuttle interim upper stages. Also assisting Mahon during the 1970s were Edward J. Kunec (program review and resource management) and Joseph E. McGoIrick (advanced programs, 1969-1976). In the fall of 1976, the management of the expendable launch vehicle program was tightened (table 1-1, Phase III). McGolrick became director of small and medium boosters, with the five vehicle managers reporting to him. In 1978, Mahon was assigned a deputy director, Robert O. Aller, and a chief for space transportation systems support projects, William D. Goldsby. The Office of Space Flight was renamed the Office of Space Transportation Systems in November 1977, but the change did not affect the launch vehicle directorate. Unfortunately for the supporter of an aggressive program or space exploration and exploitation, NASA had to make do with meager appropriations throughout its second decade. Funds for the civilian space program dropped steadily from 1966 to 1972, increased slightly in 1973, fell again in 1974, and then began slowly building in 1975. By the end of the second 10 years, NASA's budget had risen to the point where it was equivalent to 77 percent of its fattest year's budget (1965). But deflated 1978 dollars did not buy an equal percentage of goods and services for the agency. Minimal funding necessarily led to austere programs. The number of Apollo flights to the moon was reduced; plans for manned missions to Mars were scrapped; the schedule for an advanced reusable launch vehicle and spacecraft was stretched. None of the presidents who occupied the White House during the 1970s was committed to an ambitious space policy. And on Capitol Hill, some lawmakers became critical of the Apollo "moondoggle" once it became clear that there was no race to the moon against the USSR. Tax dollars, they reasoned, could be more wisely spent on war materiel going to southeast Asia, on rebuilding cities left battered by riots, on healing wounds left by racial unrest and poverty,. In their budget messages to Congress, Presidents Lyndon B, Johnson (FY 1969-70), Richard M. Nixon (FY 1971-74), and Gerald R. Ford (FY 1975-78) **** expressed the need. for a continued strong defense program (through 1972 the war in Vietnam was the biggest single drain on the defense budget), for a renewed emphasis on human resources programs (health, education, and welfare), and for a stable economy. Because of the complexity of the budget process, federal agencies were obliged to make their fiscal plans as much as two years in advance. In any one year, NASA's resource management personnel were working with three fiscal year budgets -the current operating budget; the ensuing year's budget, which was somewhere in the Bureau of the Budget/Office of Management and Budget-presidential-congressionaI approval cycle; and the preliminary budget for the next year, which was being drawn tip at NASA Headquarters based on requests for programs and projects submitted by the agency's several field centers. Because of the fierce competition for a shrinking number of dollars, NASA managers at all levels worked hard to justify their requests - internally and externally. For some NASA managers, fighting to preserve minimum funding and keeping members of Congress informed and sympathetic to the agency's needs was a full-time job (table 1-4). Table 1-3. U.S. Government Budget Outlays by Function, FY 1969-1979. Table 1-4. Simplified Steps of the NASA Budget Process. .....the Budget was renamed the Office of Management and Budget in 1971) was responsible for most of the cuts suffered by NASA budgets months before Congress acted on the requests.6 In the tables that follow, the "request" column represents the amounts agreed to by NASA, and BoB/OMB, not necessarily the initial request NASA made to the president's budget officer. Data on submissions (requests) for this volume are taken from the yearly budget estimates prepared by NASA's Office of Administration, Budget Operations Division, and from chronological histories prepared for each fiscal year by that same office. In Congress, the authorization committees and their several subcommittees intensely, examined NASA's requests and the programs for which the funds would be spent. ******* The authorization committees, which had the authority to increase or decrease budget requests, set a maximum for appropriation of funds; they imposed limitations or preconditions on how funds could be spent; and they determined how the agency could reprogram or transfer its monies among accounts. The "authorization" column in the following tables is the ceiling set by the authorization committees. Authorizations were not always listed for individual projects in the chronological histories. To determine the total amount authorized for the general category or program for a specific project, consult the chronological histories. Table 1-5. NASA Appropriations, 1969-1978. Table 1-6. NASA Research and Development Funds, 1969-1978. Following a pattern set during, the 1960s, NASA purchased the launch vehicles (Saturn 1B and Saturn V) it needed for manned missions (Apollo and Skylab) with manned spaceflight funds. All others were obtained through the Office of Space Science and Applications' (or Office of Space Science's) Launch Vehicle Procurement Office through FY 1976. In FY 1973, funds for Shuttle came from the Office of Manned Space Flight's (OMSF) spaceflight operations budget. Because of the growing importance of Shuttle, in FY 1974 a separate OMSF Shuttle account (distinct from spaceflight operations) was adopted. In FY 1977, the Office of Space Flight replaced OMSF. This new office assumed the management of expendable launch vehicles as well as the Space Transportation System (Shuttle). Table 1-7 summarizes the programmed costs of the launch vehicles NASA used during its second decade of operations, followed by tables detailing the budget history of each vehicle and of supporting research and technology/advanced studies. Only the engine-booster components (main engine, solid rocket booster, and external tank) have been included in the Space Shuttle table (table 1- 16); for more on the Space Transportation System see chapter 2. Refer to the footnotes for each table before drawing conclusions about totals for any one vehicle or one year. Table 1-7. Programmed Costs by Launch Vehicle (in thousands of dollars). Table 1-8. Launch Vehicle Supporting Research and Technology/Advanced Studies Funding History (in thousands of dollars). Table 1-9. Agena Funding History. Table 1-10. Atlas F Funding History. Table 1-11. Centaur Funding History (in thousands of dollars). Table 1-12. Delta Funding History (in thousands of dollars). Table 1-13. Saturn IB Funding History (in thousands of dollars). Table 1-14. Saturn V Funding History (in thousands of dollars). Table 1-15. Scout Funding History (in thousands of dollars). Table 1-16. Space Transportation System Main Engine and Solid Rocket Boosters Funding History (in thousands of dollars). Table 1-17. Titan IIIC Funding History (in thousands of dollars). The launch vehicles used by NASA during the agency's second 10 years are described in the tables that follow. Every launch vehicle NASA put on the pad during the decade was either in use or under development in the 1960s. Atlas, which had been employed in several configurations for manned and unmanned missions during the early years of the space age, was paired with the high-power Centaur upper stage in 1969-1978 to launch payloads destined for earth orbit or interplanetary space. In 1978, a new model, Atlas F, was tested by NASA for the first time. The agency continued to rely on Thor-Delta, in a variety of models, and the small but ever improving Scout to launch most of its applications and scientific satellites, as well as the payloads of other government agencies arid foreign governments. Saturn V continued its role in the Apollo program, delivering crews to the moon. The Skylab orbiting workshop, built from spare Saturn hardware, was launched by a Saturn V, and visiting astronaut-scientists were escorted to the laboratory by Saturn IBs. Titan III, greatly enhanced over the Titan of Project Gemini by strap-on motors and powerful upper stages, was capable of boosting large payloads to the planets. By the end of the decade, however, a launch system was being readied that promised to make these expendable vehicles obsolete, The Space Transportation System - Shuttle orbiter with external tank and two reusable solid rocket boosters- was being tested in the late 1970s. NASA officials hoped this new system would be more flexible and more economical than the traditional boosters they had relied on for 20 years. In some cases, finding the "official" figures for the height, weight, or thrust of a launch vehicle was difficult. It was not uncommon to find NASA, contractor, and media sources with conflicting data. Measurements, therefore, may be approximate. Height may be measured several different ways, and there was some disagreement in the source materials over where an upper stage begins and ends for measuring purposes. The height of a launch vehicle stack does not always include the payload (spacecraft); weight, however, does. Weight of the individual stages includes propellant (wet weight). Diameter does not take into consideration the addition of fins or strap-on engines to the base of the booster stage. Engine number changes may riot always be noted if only minor modifications were made to the engines. The following abbreviations for propellants were used throughout the tables: LH2 = liquid hydrogen, LOX = liquid oxygen, N2H4 = hydrazine, N204 = nitrogen tetroxide, RP-1 = kerosene, arid UDMH = unsymmetrical dimethlhydrazine. Thrust was expressed in newtons thrust (pounds of thrust X 4.448 = newtons). Payload capacity was measured by the number of kilograms that could be delivered to a certain orbit (measured in nautical miles converted to kilometers). When available, a listing by launch vehicle number (serial number or production number) was provided with information on how the vehicles were used. Consult table 1-18 and figure 1-3 for a summary of the success rates of NASA's launch vehicles during the 1970s. A chronology of each vehicle's development and operation also has been included. Consult volume two for pre-1969 events. Launch dates arid times were based on local time at the launch site. Figure 1-3. Launch Vehicle Success. The Air Force Atlas booster, designed as an intercontinental ballistic missile by Consolidated Vultee Aircraft Corporation (later the Convair Division of General Dynamics) in the 1950s, was used by NASA in several configurations in the agency's early years. Alone, the stage-and-a-half rocket served as one of the manned Mercury spacecraft launch vehicles in 1960-1963. To boost science and applications payloads, it was paired with Able, Agena B and D, Antares, and Centaur upper stages. During NASA's second decade, Atlas-Centaur was the only combination to survive. Atlas and Centaur, a high-energy, liquid-propellant stage developed for NASA by General Dynamics, were both uprated over the years to provide even more  boosting power. The Atlas SLV-3C, first used in a research and development test launch of Centaur in 1966, was replaced by the SLV-3D model in 1973. An Atlas F vehicle, which was paired with an apogee kick motor manufactured by Thiokol Corporation, showed promise in late 1978 as a NASA satellite launcher. Centaur's engines in the improved D-1A model (and the D-IT version used with Titan) Could burn longer and be restarted after a longer interval of shutdown time, making it especially suitable for launching interplanetary spacecraft. The improved Atlas-Centaur was also supplemented by a third-stage solid rocket motor during four missions. During the 1970s, Atlas-Centaur was put on the launch pad at the Eastern Test Range 32 times to boost intermediate-weight payloads to earth orbit and to the planets; the vehicle suffered only 4 failures. NASA planners hoped that the reusable Shuttle would be ready for operations in the late 1970s, rendering expendable vehicles such as Atlas-Centaur obsolete. When budget cuts forced the agency to stretch out the Shuttle research and development schedule, Atlas-Centaur was assured several more years of frequent use. In addition, propulsion experts at the Lewis Research Center, General Dynamics, and elsewhere were proposing that Centaur be given a new role for the 1980s: as a Shuttle interim upper stage in the Space Transportation System. Table 1-19. Atlas F Characteristics. Table 1-21. Listing of Atlas-Centaur Vehicles. [25-26] Table 1-22. Chronology of Atlas-Centaur Development and Operations. The clustered-engine Saturn launch vehicles were developed during the 1960s under the direction of Wernher von Braun at the Marshall Space Flight Center, Huntsville, Alabama. Their primary role was to support NASA's program of manned expeditions to the moon. Saturn I and Saturn IB helped qualify the Apollo spacecraft in earth-orbital maneuvers (1963-1968). The task of boosting a crew of three astronauts and their command and service module and lunar module to the moon fell to the three-stage Saturn V. The first manned landing (Apollo 11) took place in 1969, preceded by two lunar-orbital missions (Apollo 8 and 10), and one earth-orbital mission (Apollo 9) also launched by Saturn Vs. The powerful Saturn V sent six crews to the lunar surface (a seventh, Apollo 13, was forced to return because of a spacecraft malfunction) in 1969-1972. Powered by five Rocketdyne F-1 and six Rocketdyne,1-2 engines. Saturn V's total thrust was 39.4 million newtons, enough power to lift 45 000 kilograms to an escape trajectory or 129 000 kilograms to earth orbit. It stood 111 meters tall and weighed 2.6 million kilograms. North American Rockwell Corporation, the Boeing Company, and Douglas Aircraft Company served as the primary contractors. The budget cuts of the late 1960s and early 1970s left NASA, with Apollo and Saturn hardware, but no lunar missions for which to use it. Congress had forced the agency to scrap its last Apollo flights to the moon. To make use of the spacecraft and launch vehicles already procured, NASA's manned spaceflight officials sought approval for an Apollo applications program. Skylab was the flight project that evolved from this attempt to utilize Apollo surplus, In May 1973, NASA's last Saturn V launched the Skylab Orbital Workshop to earth orbit. Three three-man crews were sent to visit the laboratory by Saturn IB vehicles later that year. Saturn 1B was used one more time by the space agency. In July 1975, it launched  an Apollo crew to earth orbit, where they met and docked with a Soviet Soyuz spacecraft. The Apollo-Soyuz Test Project marked the last use of Apollo hardware (see table 1-25 for a listing of Saturn flights). Table 1-23. Saturn 1B Characteristics. Table 1-24. Saturn V Characteristics. Table 1-25. Listing of Saturn IB/Saturn V Vehicles. At 63 seconds after liftoff, the meteoroid shield protecting Skylab was torn off by vibrations suffered by the launch vehicle, damaging the laboratory's solar array system. Subsequent analyses revealed that the shield separation straps had failed. The workshop was positioned in the correct orbit and the damage repaired by the first crew to visit it. The four-stage solid propellant Scout served as 'NASA's small-payload launch vehicle for both the first and second decades of the space agency's existence. NASA inherited specifications for the rocket from the National Advisory Committee for Aeronautics (NACA) and awarded contracts for its development in 1959. The first successful research and development launch took place the next year. From 1960 through 1978, NASA used the Scout vehicle 71 times to launch Explorer-class satellites and a variety of international payloads. Under the direction of the Langley Research Center and the Ling Temco Vought Corporation (later Vought Corporation), the prime contractor, the Scout configuration evolved. The rocket motors of all four stages were either upgraded or replaced by a new model at least three times (see table 1-27; and volume 2, table 1-70). With each major improvement, Scout's payload capacity increased.- from 59 to 193 kilograms (to a 555-kilometer orbit). The Air Force also employed a Scout configuration in its satellite program, Scout vehicles were launched from Wallops Island, Vandenberg Air Force Base, and the San Marco mobile platforms off the Kenya coast. Table 1-26. Scout Characteristics (as of 1978). Table 1-27. Scout Stage Development, 1969-1978. Table 1-28. Listing of Scout Vehicles. Table 1-29. Chronology Of Scout Development and Operations. During NASA's first 10 years, the Thor booster, an intermediate range ballistic missile developed for the Air Force by the Douglas Aircraft Company (later McDonnell Douglas Corporation), was used alone for suborbital communications satellite tests and with Able, Agena B and D, and Delta upper stages to orbit medium-weight payloads. Thor's power was increased during the 1960s by lengthening its tank and by adding strap-on solid rocket motors to its base. The 1970s saw Thor grow even taller and adopt a new booster propulsion system. Delta, a two-part upper' stage (actually two stages) also manufactured by McDonnell Douglas, and Lockheed's Agena were the only stages paired with Thor during the 1970s. Like Thor, Delta was uprated to provide more power and more sophisticated guidance capabilities, The Thor-Agena D configuration, used only four times in the second decade, retained its original characteristics (see table 1-30). NASA put eight different Thor-Delta combinations on the launch pad in 1969-1978. The "Standard Delta" C model's MB-3 block II engine was uprated to a block III in 1965; and RS-27 (H-1) engine powered the booster in the 2000 series, which was first used in 1974. Thor's tank was extended further in the 1000 series (1972). Solid motors to augment the booster stage were first strapped to Thor in the 1960s, growing in number from three to nine by 1972. The Castor I strap-on was replaced by Castor II on the Thor-Delta L, M, and N models (1968), and the much larger Castor IV made its debut on the 3914 model in 1975. Delta's engine was uprated with the introduction of the E model (1965) and again with the 904 (1972). An entirely new engine, the TR 201, was incorporated into the second stage of the 2000 series in 1974, During the 1970s, Thiokol Corporation's TE-364-3 or 364-4  solid-propellant motors were used in the small but powerful Delta third stage to position a payload into precise orbit. See table 1-31 and figure 1-4 for more information on Thor-Delta models. Thor-Delta 3914 was the most powerful of the five models introduced in 1969-1978. It differed from the much-used 2000 series only in its substitution of the larger Castor IV strap-ons. Delivering 4.69 million newtons thrust, model 3914 stood over 35 meters tall. It could send 900 kilograms to a synchronous transfer orbit. The 2000 series routinely put 1800-kilogram payloads into 370-kilometer orbits and 700 kilograms into synchronous transfer orbits. Table 1-30. Long-Tank Thrust-Augmented Thor-Agena D (Thorad-Agena D) Characteristics. ....included the Orbiting Solar Observatory, Explorer, Biosatellite, Landsat, and Nimbus. A special Package Attitude Control (Pac) system was carried piggyback on a Delta second stage during the August 9, 1969, launch of the OSO 6 satellite. Pac was inserted into orbit (547 x 483 km) to flight test a long-life, low-power, three-axis, earth-stabilized control system for the Delta second stage and to demonstrate the feasibility of using this stage as a platform for experimental payloads. Table 1-31. Thor-Delta 3914 Characteristics. Figure 1-4. Thor-Delta Development, 1969-1978. * Two other models that built on the Delta E configuration were the Delta G (two stages only) and the Delta J (TE 364-3 third stage). The Delta E model was the most popular of the 12 Delta configurations. ** The 1904 Delta had a 1.65-meter fairing; the 1914 Delta a 2.44-meter fairing. [35-37] Table 1-32. Listing of Thor-Delta Vehicles. Table 1-33. Chronology of Thor-Delta Development and Operations. The Titan III concept, which ;dates from the early 1960s, was the product of the Space and Missile Systems Organization (SAMSO) of the Air Force Systems Command. From three classes of components (liquid rocket cores, solid rocket motors, and upper stages, a variety of launch vehicles could be assembled. Martin Marietta (formerly the Martin Company), the manufacturer, offered the Air Force and NASA a standard and a stretched core (the two Titan stages), five- and seven-segment strap-on solid motors, as well as the small Algol strap-ons, and six upper stages (the Transtage and Centaur being the most commonly used). The Air Force conducted its first test flight (Titan IIIA) in September 1964 and by the spring of the following year was trying to sell the idea of the versatile Titan to NASA. NASA's long-range planners of the mid-1960s did not foresee the agency's adoption of the Titan III. Atlas-Centaur would serve their needs until a reusable launch vehicle was ready. What the NASA officials failed to predict were the severe budget reductions Congress would impose on the civilian space program, reductions that forced the scrapping of a nuclear-powered upper stage and stretching of the schedule for the development of a reusable Shuttle. NASA needed a vehicle more powerful than Atlas-Centaur to launch interplanetary payloads (Viking and Voyager) it had planned for the 1970s. In 1967, NASA began to study seriously the possibility of adapting to its needs the Titan III paired with the Centaur upper stage. By early 1968, the space agency had decided to add the Air Force launch vehicle to its table. Lewis Research Center mariaged NASA's participation in the Titan III program (see table 1-37 for a more detailed chronology of events). NASA used the Titan IIIC (with the Transtage) only once (table 1-34). In May 1973, it launched ATS 6 into earth orbit. It was the Titan IIID-Centaur combination that most attracted the agency's attention (table 1-35). As modified and improved to suit NASA's payloads, the vehicle was renamed Titan IIIE-Centaur D-1T. NASA's first test of this powerful duo (13.55 million newtons thrust) on February 1974 ended in failure because of the malfunction of a proven Centaur component, but the first satellite launch 10 months later (Helios 1) was an unqualified success. The bulbous launch vehicle with its two strap-on booster rockets performed equally well in 1975-1977 for Viking 1 and 2, Helios 2 and Voyager 1 and 2 (table 1-36). Table 1-34. Titan IIIC Characteristics. Table 1-35. Titan IIIE-Centaur Characteristics. Table 1-36. Listing of Titan IIIC/Titan IIIE -Centaur Vehicles. [41-42] Table 1-37. Chronology of Titan III Family Development and Operations. In their attempt to reduce the number of throwaway elements in any mission, NASA engineers sought to design an orbital spacecraft that could be boosted by reusable launch vehicle and returned like an airplane, ready to be used again with some refurbishing. For reasons of economy, early drawings of a delta-wing craft perched on a much larger winged launch vehicle capable of flying back to the launch site were replaced by visions of a more modest Shuttle craft sent to orbit by expendable or partly expendable vehicles. Titan and Saturn were the two most popular candidates for the interim expendable booster role in the early 1970s. An alternative to an enhanced Titan or Saturn, which were liquid-propellant vehicles, was a large solid-propellant booster that could work with the Shuttle's main engine to launch the spacecraft. In the fall of 1971, NASA directed its contractors to determine the feasibility of recovering and reusing traditional ballistic boosters. ++ Satisfied that an interim launch system could be at least partly reusable, the agency set four companies to work in January 1972 studying the practicality of using 3- and 4-meter (120-and 156-inch) solid motors as part of the booster package.+++ In mid-March, NASA Headquarters announced its decision: the Shuttle orbiter (75 000 kilograms), which would be mounted to the side of a large external fuel tank (719 000 kilograms), would be launched by its own liquid-propellant main engine and two solid rocket boosters (SRBs). It would be more economical and faster to produce a satisfactory solid booster than to develop a new or to substantially rework an existing liquid-fueled system. Keeping the total price of the Space Transportation System to a minimum had become a pervasive concern when the President approved the program on January 5, 1972. NASA selected Thiokol Chemical Company to develop the Shuttle solid rocket boosters in November 1973. Designed to produce more than 12.5 million newtons thrust each, the new motors were static fired for the first time in 1977. The SRBs, made of 11 individual segments, were 45.4 meters tall and weighed 569 000 kilograms. The largest solid stages ever built, they were designed as the Space Transportation Systems' "primary propulsive element providing impulse and thrust  vector control . . . from ignition to SRB staging." 9 The two boosters would be strapped to either side of the external tank (figure 1-5). At approximately two minutes after launch, their fuel supply expended, the SRBs would be jettisoned, their fall to the Atlantic Ocean (and later the Pacific Ocean) being checked by a trio of parachutes. From the ocean, they would be retrieved, refurbished, and reused-up to 20 times. NASA's Marshall Space Flight Center, Huntsville, Alabama, was charged with monitoring the contractors working on the new boosters. Figure 1-5. The Shuttle orbiter was designed to be attached to the large external tank, which supplied liquid propellant to the orbiter's engines. The two SRBs fired in parallel along with the Shuttle main engine at liftoff. Figure 1-6. The SRB structural subsystem provided structural support for the vehicle on the pad, transferred thrust loads to the external tank-orbiter combination, and provided housing, structural support, and bracketry necessary for the recovery system, electrical components, Separation motors, and thrust vector control system. Figure 1-7. At 2 minutes, 12 seconds, into the mission, the SRBs are designed to separate from the external tank-orbiter combination at an altitude of 46 kilometers. Five minutes later, the spent boosters would land in the ocean. Table 1-38. Shuttle :Solid Rocket Booster Characteristics. [48-50] Table 1-39. Chronology of Shuttle Solid Rocket Booster Development. * These numbers do not include the several variations of Thor boosters and Delta upper stages with which NASA experimented during this time. ** The three other vehicles used were Atlas F (one time in 1978), Thorad-Agena D (four times in 1969-1970), and Titan IIIC (one time in 1973). *** Consult chapters 3 and 4 for more information on space science and applications payloads. **** The president's budget request for a fiscal year was usually delivered to Congress at least a full calendar year in advance. Therefore, it was not uncommon for a new chief executive to inherit a budget from his predecessor. ***** Included in this category were community and regional development; education, training, employment, and social services; health; income security; and veteran's benefits and services. ****** Research and program management (RPM) funds were used for necessary expenses of research in laboratories, management of programs and other activities not otherwise provided for, including uniforms or allowances, minor construction, awards, hire, maintenance, and operation of administrative aircraft, purchase and hire of passenger motor vehicles, and maintenance, repair, and alteration of real and personal property. The construction of facilities account provided for advance planning, design, and construction of facilities and for the acquisition or condemnation of real property. ******* Along with many other agency and office requests, NASA's budget submissions were considered by Congress under the title: Independent Offices and Department of Housing and Urban Development. Examples of other "independent offices" include the National Science Foundation, the General Services Administration, the Federal Home Loan Bank Board, and the Federal Trade Commission. + Seven of these payloads were launched with only three launch vehicles; two others were launched with NASA payloads, for a total of 55 launches that were completely sponsored by organizations other than NASA. Five of these launch attempts experienced some degree of vehicle failure. ++ Shuttle studies were conducted by North American Rockwell Corporation with General Dynamics Corporation, by McDonnell Douglas Astronautics Company with Martin Marietta Corporation, by Grumman Aerospace Corporation with Boeing Company, and by Lockheed Missiles and Space Company. +++ Under the direction of the Marshall Space Flight Center, Aerojet-General Corporation, Lockheed Propulsion Company, Thiokol Chemical Company, and United Technology Center conducted the solid motor studies.